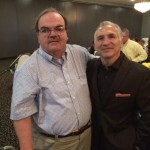 Ray Mancini is a kind man. He also understands the mission of ISLE, Purple Cat, and Goldenstringradio.org. 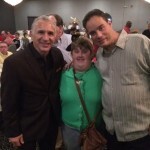 On Friday, October 9, 2015 his foundation, The Ray Mancini Foundation, sponsored and hosted a Harvest Dance at Mr. Anthony’s in Boardman. Over 150 of his new friends from the organizations attended the dinner. They were treated to gourmet food, a talk from Ray and his wife, Tina, caricatures from a Pittsburgh artist, and the dance sounds of goldenstringradio.org. 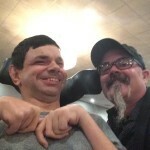 In fact, goldenstringradio.org accomplished its first live remote from Mr. Anthony’s at the event. DJs Scott Mincher, Russell “Radar” Pavlov, Mark Castro, Tim Gilboy, Wayne Zeidenstein, Tommy Nagle, and DeAndre Robinson (among others) chose the tunes. 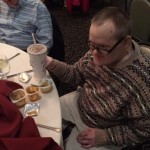 Goldenstringradio.org DJ, Scott Mincher was also the subject of a heartfelt speech made by Tina Mancini. She described Scott as her “inspiration”. We at ISLE, Purple Cat, and Golden String agree with that.